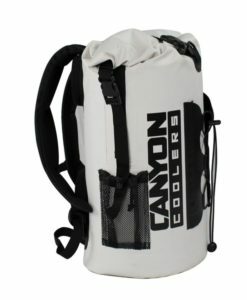 The latest hands free addition to the Adventure Series by Canyon Cooler is the newly redesigned Quest backpack soft-sided cooler. The 25 qt. soft-sided backpack cooler with tough-as-nails, raft grade 800 denier RF welded PVC shell, closed cell AirCore insulation and lined with a newly upgraded, closed-cell IceSkin, provides days of ice retention in an easy to transport, comfortable backpack. The thickly padded shoulder straps, and back support pads make for comfortable hiking even on tough terrain, and a cold (or hot!) lunch wherever your trail takes you.